Transmuting Anger is a series of melodic fragments cued by alchemy symbols and tied together with improvised music, focused on the exploration of women's anger around #metoo, sexism and sexual harassment. The work premiered on January 12th, 2018 as part of the NYC Winter Jazzfest. The following are excerpts from the live performance. Track now available for download as part of Strength in Numbers on Chant Records! Sarah Manning is a saxophonist and composer. She fights for creative sustainability by building empathy between artist and fan through performing, writing, and speaking. She has released four critically acclaimed albums and currently leads the band Underworld Alchemy with Briggan Krauss on guitar, Simon Jermyn on electric bass, and Gerald Cleaver on drums. Her most recent release, Harmonious Creature (Posi-Tone 2014) received 4 stars in Down Beat Magazine and was chosen as a top ten Jazz album of 2014 by the LA Times. In addition to a Fellowship in Composition from the MacDowell Colony in 2012, she has received grants from the Northampton Arts Council and the Puffin Foundation to support performance residencies that break down the barrier between artist and audience. Producer Marc Free. Engineer Nick 0'Toole. Assistant Engineer Michael Brorby. Recorded January 30th, 2013 at Acoustic Recording, Brooklyn, NY. Harmonious Creature made Chris Barton's Top Ten list for 2014 Jazz in the LA Times! "Sarah Manning is to the alto sax what JD Allen is to the tenor: even in a world of rugged individualists, she stands out...Her bright, defenestrating, Jackie McLean-esque tone, angst-fueled crescendos and stunningly uneasy tunesmithing also set her a step ahead of the pack. Her previous 2010 Posi-Tone release, Dandelion Clock, was that year’s underrated gem. It may be early in the year, but her new album Harmonious Creature threatens to be the best of 2014." "Melodies with a back-porch languor that sometimes jump out of their chair and go off and running, harmonies that melt into the skin like rays of sun, and rhythms that develop an amicable chatter, never losing their conversational demeanor. Just a lovely album, rich with textures." "Alto saxophonist Sarah Manning asserts her individuality on this disc...For the interpretation of [Neil] Young’s “On The Beach‚” Kang creates squealing‚ bagpipe-like sounds‚ while Jennings bangs out a heavy beat. The group works itself into a fuzzed-out frenzy‚ taking the song to an apex that the overdrive-loving Young would probably dig." Third place in the 2010 JazzTimes Reader's Poll in the Category of Best New Artist! UNDERWORLD ALCHEMY AT SOUP & SOUND! APPEARING WITH BRIGGAN KRAUSS SOLO (ALTO SAXOPHONE), CELEBRATING THE RELEASE OF HIS SOLO CD AND THE DAN PECK (TUBA)/ERICKA DICKER (VIOLIN) DUO. UNDERWORLD ALCHEMY AT THE ROYAL ROOM! Show starts at 7:30PM. Underworld Alchemy at 8:30PM. Suggested Donation. This special Spinning Wheel Closing Party will include an opportunity to take a last look at the exhibition, as well as a performance by Mixed Movement featuring live remixing of the archive, and the steve ben israel commission winner, Monique Mizrahi, in addition to a DJ set by Baba Israel. FREE! Come experience and take part in The Winning Spiel, inspired by the life and work of steve ben israel, legendary performer, activist, jazz musician, poet, stand-up comic and core member of the Living Theater. Musician/creator Monique Mizrahi joins forces with sacred herbalist Paula Winograd and saxophonist Sarah Manning in this new participatory piece, a Yiddish-flavored pacifist ritual. Gather in the exhibition space at BRIC to harmonize through stretching, kvetching and songs. Everyone's a winner in this "seance to contact the living" (a line from steve ben's shows), so leave your guns at home, your phones at the door and come get yourself a third eye, baby! with Briggan Krauss on guitar. New compositions! Conduction project. Featuring Brandon Ross and Briggan Krauss on electric guitars. Kenny conducts! New trio! We'll be playing my compositions and those of Simon Jermyn and Jeff Davis. Take the F or R trains to 4th Ave & 9th Street. Walk down 4th ave to 7th street. Make a left on 7th and walk past 3rd ave. Ibeam is located on the ground floor, the grey doors to the right of the stairs of #168. This tribute to Yusef Lateef is part of Aram Bajakian's residency at the Stone this week. Aram, Alex and I all studied with Dr. Lateef. It was a remarkable and life-changing experience. I'll be appearing as part of the horn section for singer/songwriter/multi-instrumentalist Monique Mizrahi's CD Release party for her new album, Out Comes Woman. Also featuring Jen Baker on trombone. As an interesting note of trivia, Monique, Jen and I attended Interlochen Arts Academy together (I received scholarship to Interlochen to study jazz for one year). This is the first time we've performed together since high school! As the featured guest artist with the Green Street Trio, I will play a set with the band from 7:30-8:30PM. Afterwards there will be an open session. Past guest artists include Gary Smulyan, Erik Lawrence, Claire Daly, Steve Davis and Grant Stewart. Join us in this venerable room as part of a special new series curated by Mark Kirby! Free Concert in a unique space surrounded by delicious things. and what you can do for creative sustainability! Roulette Brooklyn is at 509 Atlantic Avenue. Really! And it's free, too. Appearing with Fung Chern Hwei's Downtown Avengers! The Downtown Avengers: The Throwdown, grand return at 8:30pm!!! Harmonious Creature NYC CD Release Concert! The official CD Release Concert for Harmonious Creature! Posi-Tone Records 1/21/14. Come celebrate with us! $10 Cover, $10 minimum (can be applied to food or drink). Full dinner menu available! At I-Beam, I'll highlight the music on my brand new release Harmonious Creature on Posi-Tone Records(release date January 21st). With compositions that unite the small town and the metropolis, the lofty ceilings of I-Beam will open to the night sky. At the right moment, in the drone of Goldberger's guitar and the shouts of alto and viola over the formless form spun from Miller's drums and Hart's bass, you might just see the twitch of a white-tipped tail. Duo performance with Allison Miller on drums. Part of a week at the Gallery featuring performances and readings by women. As the featured guest artist with the Green Street Trio, I will play a set with the band from 7:30-8:30PM. Afterwards there will be an open jam session. This regular Tuesday night series draws many talented local musicians and listeners, and I'm excited to share a standard or two that I know will resonate with the seasoned audience. Past guest artists include Gary Smulyan, Erik Lawrence, Claire Daly, Steve Davis and Grant Stewart. 2013 Saalfelden Jazz Festival with Zion 80! Harmonious Creature in Western Massachusetts! In November of 2012, saxophonist/composer Sarah Manning spent a couple of weeks as a Composition Fellow at the MacDowell Colony in NH, writing new music in the company of a bear, porcupine, coyote, barn owl, yellow spotted salamander, and a piano Aaron Copland used while in residences many moons ago. She got her start at Fire & Water and the sidewalks of Northampton. After three albums and performances from Tanglewood to Yoshi's in CA and Dizzy's in NYC, she is thrilled to perform at Cafe Evolution both for its intimate setting and yummy vegan food. Join her as she shares the new music, part of an upcoming release for Posi-Tone Records with her NYC band. And be sure to save room for a vegan cupcake (or two). Come by 7PM to enjoy Cafe Evolution's full kitchen and jazz inspired meals (check out A Love Supreme). Beverages and treats available at show. 9 PM - 10PM at the Schwemm’s Backroom Coffeehouse, which is located in the Keefe Campus Center. Catch Harmonious Creature as they premiere new music on their way into the studio later in the week for Posi-Tone Records! Much of the music was written by Manning this past fall while a MacDowell Colony Fellow in Composition, in the company of a bear, porcupine, coyote, spotted salamander and barn owl. Zion 80 is a fascinating project of guitarist Jon Madof, and features a rotating cast of characters depending on the night which includes Frank London on trumpet, Jessica Lurie, Matt Darieau and Greg Wells on sax, Jonathan Goldberger and Aram Bajakian on guitar, Shanir Blumenkranz on bass, Aaron Alexander, Yuval Lion, and Mathias Künzli on drums and percussion. Zion80 explores the music of Rabbi Shlomo Carlebach through the lens of the Afrobeat master Fela Anikulapo Kuti. Open rehearsal begins at 7:30, set begins at 9:00. $10 donation at door. Harmonious Creature imbues Jazz Vesperswith afternoon lullaby tinged with an underbelly of harmonic dissonance. Featuring Sarah Manning (alto saxophonist/composer), Skye Steele on violin, Dave Juarez on guitar, Ike Sturm on bass and Darrell Green on drums. Harmonious Creature lumbers into Manning's hometown of Torrington, CT! Featuring Sarah Manning as alto saxophonist/comp Aram Bajakian on guitar, Skye Steele on violin, Ike Sturm on bass and Jerome Jennings on Drums. Tickets are $30 and available online or through the box office. 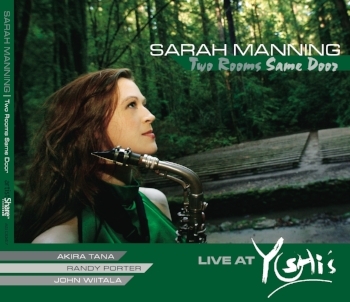 Featuring Sarah Manning's Harmonious Creature with Skye Steele on violin, Aram Bajakian on guitar, Rene Hart on bass and Jerome Jennings on drums. $15 to get in, includes a glass of wine! Beautiful escape from NYC for those city-dwellers, or an escape to some urban sounds if you already live amongst the greenery. Debut of Sarah Manning's "Harmonious Creature"! Sarah Manning - also saxophone, composer Skye Steele - violin Aram Bajakian - guitar Jerome Jennings - drums According to arts blog Lucid Culture, "Not only is Sarah Manning a fearless and intense player, she's a fearless and intense composer." But what of this Harmonious Creature? Is it unwieldy? Unsettling? Powerful or delicate? Should it be tamed, or will it curl up at your feet? Let it envelop you with sound, and decide for yourself. From the official press release: The annual Labor Day Weekend Tanglewood Jazz Festival will take place September 2-4 at the summer home of the Boston Symphony Orchestra in Lenox, Massachusetts. Jazz greats highlighting this year's festival include Dianne Reeves, Angelique Kidjo, Lizz Wright, NEA Jazz Master Jimmy Cobb, Mary Stallings, the Mingus Orchestra, Edmar Castaneda, NES Jazz Master Gunther Schuller, John Santos, Federico Britos, Geri Allen, Terri Lyne Carrington, Rumero Lubambo, James Genus, Munyungo Jackson, Judy Carmichael, Michael Kaeshammer, Robin McKelle, Ulysses Owens, Sarah Manning, Rebecca Martin, Larry Grenadier, Bill McHenry, Cedric Hanriot and more. All shows will be held in Seiji Ozawa Hall and Jazz Cafe. Tanglewood Jazz Festival prices range from $18-77. One day jazz lawn passes are $34. Tickets are available through Tanglewood's website, www.tanglewood.org, by calling SymphonyCharge at 617-266-1200 or 888-266-1200, or by visiting the Boston Symphony Orchestra Box Office at 301 Massachusetts Avenue, Boston MA.